And so it continues, my kitchen is minus two cabinets that are being reconfigured and so their contents occupies valuable counter space and boxes filled now reside in the “office”, but life goes on as does dinner, but again easy and quick is in order so I begin the week with Jacques Pepin as my choice once again for our weekly challenge at the cooking club and this week a special “first” for me an Instant Pot recipe…what could be a better choice for a first new cooking experience and the recipe is very adaptable to your own selection of additional ingredients. The Instant Pot is a great appliance so far as I can tell and a pot if chili is just an hour or so away or better yet as chili always tastes better made in advance and served a day or two later with all of your favorite chili garnishes. I used a nice chunk of chuck roast cut into 1/2 inc cubes, but you can you a good ground beef if you prefer, I like chunks, meaty chili and I can control the amount of fat that goes into the pot if I cut the meat myself. Other than that the ingredients are the usual suspects peppers onions, garlic etc. I like to add a variety of peppers like serrano, poblano and hatch green chilies keeping in mind the heat level of each. Brown the meat toss in the remainder of the ingredients, yes even dried beans or you can use the quick soak method for the beans while you prep all of the chili ingredients…no the garnishes do not go into the pot, well maybe a little cilantro. I fiddled with the liquid ingredients just a little since I didn’t want a soupy watery chili coming from the pressure cooker. Put all the ingredients except the garnishes in a to 6-quart pressure cooker or follow Instant Pot instructions. Bring to a rolling boil, uncovered, over high heat. Mix well, secure the lid on the cooker, and cook over high heat until the gauge indicates that the pressure inside is on high. Reduce the heat to very low and cook for 50 minutes. Decompress the cooker according to the manufacturer’s instructions. Open the lid, stir the chili, and add more salt and pepper, if desired. Remove the bay leaves. Suggested by Jacques…To serve, arrange the lettuce leaves to resemble cups on four plates and ladle the chili into the leaves. 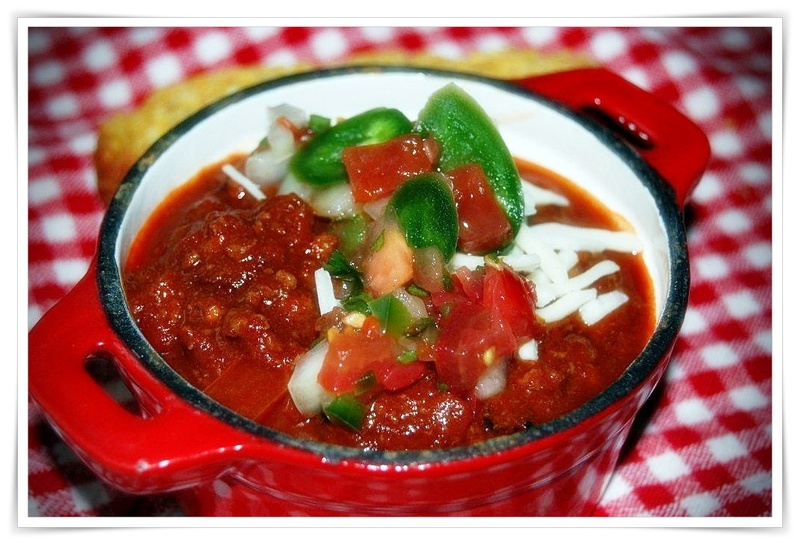 Sprinkle on some cheese, red onion, and cilantro or set out garnishes for others to decorate their own bowl of chili. Note: In a pinch or as a matter of routine look around for the prepackaged chili seasoning kits to make life a little easier…two of my favorites over the centuries, Shot Gun Willie’s and 2-Alarm Chili, both very good and along the addition of fresh garlic etc.